This is a scalable context timeline. 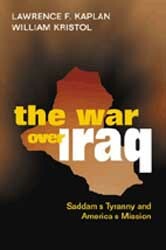 It contains events related to the event November 29-30, 2001: Neoconservative Group Encourages Bush Administration to Invade Iraq as First Step to Dominating Middle East. You can narrow or broaden the context of this timeline by adjusting the zoom level. The lower the scale, the more relevant the items on average will be, while the higher the scale, the less relevant the items, on average, will be. In conjunction with his huge peacetime military buildup (see Early 1981 and After), President Reagan strongly opposes any sort of arms control or limitation discussions with the Soviet Union. Reagan officials reopen the stalled Intermediate-Range Nuclear Forces (INF) arms limitation talks with the Soviet Union, against the advice of President Reagan’s more hardline officials (see January 1981 and After). The talks center on the Soviets’ SS-20 missile, designed to strike European targets. In return, then-President Carter had agreed to deploy US intermediate-range nuclear missiles—Pershing II’s and Tomahawks—in West Germany and Italy by 1983. According to author J. Peter Scoblic, the missiles have little real military value, as American ICBMs, submarine-based nuclear missiles, and long-range bombers could destroy Soviet targets with near-impunity. They do, however, have some political significance, mostly in helping tie European security to US security. Carter had agreed to open talks with the Soviets to get rid of the SS-20s entirely. Hardliners Sabotage Talks - The more pragmatic Reagan officials succeed in reopening the talks; Reagan hardliners, thwarted in stopping the talks, set about sabotaging them in any way available. 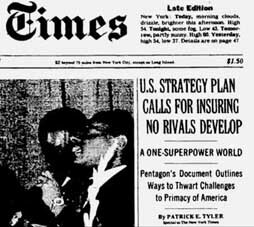 When arguments in favor of delays and “further study” finally fail, they pressure Reagan to offer an agreement they know the Soviets will refuse: the so-called “zero option,” which originates with Defense Department official Richard Perle (see Early 1981 and After). Perle says that the Soviets should remove all of the SS-20s, and in return, the US will not deploy its Pershings and Tomahawks—in essence, having the Soviets concede something for essentially nothing. State Department officials suggest a fallback position in case the Soviets reject Perle’s offering; in his turn, Perle appears before the Senate Armed Services Committee and compares anyone who opposes his zero-sum offering to Neville Chamberlain’s appeasement of Adolf Hitler in 1938. 'Walk in the Woods' - When the Soviets reject Perle’s option, Reagan hardliners argue that the government should accept no compromise. The head of the INF negotiation team, Paul Nitze—a Cold War figure who has come out against arms control (see January 1976) but is not fully trusted by the hardline ideologues because of his history as an arms negotiator—wants a compromise. In official negotiations, he sticks to the all-or-nothing position of Perle, but opens private, informal negotiations with his Soviet counterpart, Yuli Kvitsinsky. One afternoon in 1982, Nitze and Kvitsinsky go for what later becomes known as their “walk in the woods.” Sitting together on a log during an afternoon rainstorm, the two hammer out an agreement that greatly favors the US—mandating a 67 percent reduction in Soviet SS-20s and allowing the US to deploy an equal number of Tomahawks. Not only would the Soviets have to reduce their already-deployed contingent of missiles and the US be allowed to deploy missiles, because the Tomahawks carry more independent warheads than the SS-20s, the US would have a significant advantage in firepower. The deal also sets limits on SS-20 deployments in Asia, and forbids the Soviets from developing ground-launched cruise missiles. In return, the US would agree not to deploy its Pershing missiles. President Reagan, giving a speech at his alma mater, Eureka College, renames the US-USSR SALT (Strategic Arms Limitation Talks) negotiations START (Strategic Arms Reduction Talks). The renamed negotiations reflect profound dissension within the administration for and against arms limitation talks (see January 1981 and After and Early 1981 and After). State Department official Richard Burt, formerly opposed to arms negotiations, wants to ramp up the SALT talks and seek reductions in warheads and launchers. Defense Department official Richard Perle, the neoconservative who is working to block another arms limitation with the Soviet Union (see September 1981 through November 1983), wants to focus on payloads and “throw weight.” The administration’s compromise between the two positions—START—“ma[kes] no sense whatsoever,” according to author J. Peter Scoblic. Initial Proposal Unacceptable to Soviets - START’s initial position—reducing each side’s deployment to 850 nuclear missiles and 5,000 warheads, of which no more than 2,500 can be on ICBMs—sounds like a significant reduction on paper, but many experts on all sides of the nuclear arms issue worry that such an agreement, putting so many warheads on so few missiles, would actually encourage each side to consider a first strike in a crisis. Arms control proponent Paul Warnke says, “If the Russians accept Mr. Reagan’s proposal, he’ll be forced to reject it himself.” But because of the disparity in missile configurations between the US and the Soviets, such an agreement would require the Soviets to drastically reduce their nuclear arsenal by 60 percent, while the US would lose almost nothing; therefore, the Soviets would never agree to such a proposal. Scoblic will note that as an opening gambit this proposal might be successful, if the Americans were prepared to back down somewhat and give the Soviets something. But the US negotiators have no intention of backing down. The Soviets are keenly interested in the US agreeing to reduce the number of cruise missiles it has deployed, but Reagan signs a National Security Directive forbidding US negotiators from even discussing the idea until the Soviets made significant concessions on “throw weight,” essentially tying his negotiators’ hands. 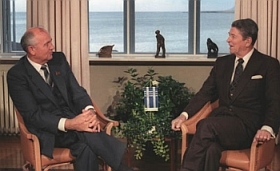 Gorbachev and Reagan at the Reykjavik summit. [Source: Ronald Reagan Library]President Reagan and Soviet Premier Mikhail Gorbachev meet in Reykjavik, Iceland, for a second summit, to follow on the success of their first meeting almost a year before (see November 16-19, 1985). They base their discussion on Gorbachev’s January proposals of deep cuts in the two nations’ nuclear arsenals (see January 1986). Agreement Founders on SDI - The heady moment is lost when the two sides fail to reach an agreement on SDI—the Americans’ “Star Wars” missile defense system (see March 23, 1983). Gorbachev cannot accept any major reductions in nuclear weapons if the US has a viable missile defense system; Reagan is convinced that SDI would allow both sides to eliminate their nuclear weapons, and offers the SDI technology to the Soviets. Gorbachev finds Reagan’s offer naive, since there is no guarantee that future presidents would honor the deal. Reagan, in another example of his ignorance of the mechanics of the US nuclear program (see April 1981 and After), does not seem to realize that even a completely effective SDI program would not defend against Soviet cruise missiles and long-range bombers, and therefore would not end the threat of nuclear destruction for either side. 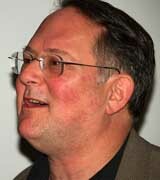 Author J. Peter Scoblic will later write, “[SDI] would have convinced the Soviet Union that the United States sought a first-strike capability, since the Americans were so far ahead in cruise missile and stealth bomber technology.” Gorbachev does not ask that the US abandon SDI entirely, but simply observe the terms of the 1972 Anti-Ballistic Missile treaty (see May 26, 1972) and confine SDI research to the laboratory. Reagan refuses. Gorbachev says that if this is the US’s position, then they would have to “forget everything they discussed.” Foreign Minister Eduard Shevardnadze breaks in, saying that the two nations are “so close” to making history that “if future generations read the minutes of these meetings, and saw how close we had come but how we did not use these opportunities, they would never forgive us.” But the agreement is not to be. President Bush gives a speech at the National Defense University outlining what he calls a “new strategic framework” for the nation’s strategic defense policy. “This afternoon, I want us to think back some 30 years to a far different time in a far different world,” he tells his listeners. “The United States and the Soviet Union were locked in a hostile rivalry.… Our deep differences were expressed in a dangerous military confrontation that resulted in thousands of nuclear weapons pointed at each other on hair-trigger alert. Security of both the United States and the Soviet Union was based on a grim premise: that neither side would fire nuclear weapons at each other, because doing so would mean the end of both nations.” Bush is referring to the concept of “mutual assured destruction,” or MAD, which has driven the policies of the US and the former Soviet Union since the 1950s. “We even went so far as to codify this relationship in a 1972 ABM [Anti-Ballistic Missile] Treaty (see May 26, 1972), based on the doctrine that our very survival would best be insured by leaving both sides completely open and vulnerable to nuclear attack,” he says. 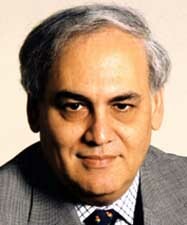 According to a later account provided by CIA Director George Tenet, he bumps into Pentagon adviser Richard Perle in the White House who tells him, “Iraq has to pay a price for what happened yesterday, they bear responsibility.” Tenet, recalling his reaction to Perle’s statement, later says, “I’ve got the manifest with me that tells me al-Qaeda did this. Nothing in my head that says there is any Iraqi involvement in this in any way shape or form and I remember thinking to myself, as I’m about to go brief the president, ‘What the hell is he talking about?’” (Note: Tenet says in his book that this incident happened on September 12; however, after Perle insists that he was not in the country that day, Tenet concedes that it may have happened a little later). [Tenet, 2007; CBS News, 4/29/2007; CNN, 4/30/2007] On September 16, 2001, Perle will hint in a CNN interview that Iraq should be punished for the 9/11 attacks (see September 16, 2001). Reasserting Dominance in Middle East - The US can win this “struggle for power in the Persian Gulf” by “reasserting our role as the region’s dominant power; as the guarantor of regional security; and as the protector of Israel, moderate Arab regimes, and the economic interests of the industrialized world.” Donnelly and Schmitt trace the US’s problems in the region back to the decision not to overthrow Hussein in 1991 (see January 16, 1991 and After). “As Saddam has crawled back from defeat,” they write, “bin Laden has grown increasingly bold. Meanwhile, our regional allies have begun to hedge their bets, not only with the terrorists and Iraq, but with Iran as well.” The US should focus on routing both bin Laden and Hussein from the region, they say. It is unclear if Hussein was involved in the 9/11 attacks, they say, though they assert that Hussein was “implicated in the 1993 World Trade Center bombing (see February 26, 1993 and October 2000).… But as with bin Laden, we have long known that Saddam is our enemy, and that he would strike us as hard as he could. And if we have learned anything at all from [the] past week, it is that adopting a defensive posture risks attacks with unacceptable consequences. The only reasonable course when faced with such foes is to preempt and to strike first.” Overthrowing Hussein “is the key to restoring our regional dominance and preventing our enemies from achieving their war aims.… When Bush administration officials speak of ‘ending’ regimes that participate in the war against America, they must mean Saddam Hussein’s Iraq” (see Before January 20, 2001). Bernard Lewis, a professor arguing that the US is facing a clash of civilizations with the Islamic world. Fareed Zakaria, a Newsweek editor and columnist. Mark Palmer, a former US ambassador to Hungary. Fouad Ajami, director of the Middle Eastern Studies Program at the Paul H. Nitze School of Advanced International Studies. James Wilson, a professor and specialist in human morality and crime. Ruel Marc Gerecht, a former CIA Middle East expert. Steve Herbits, a close consultant to Defense Secretary Donald Rumsfeld. Neoconservative founder Norman Podhoretz, a senior foreign adviser to Republican presidential frontrunner Rudolph Giuliani, says the US has no other choice than to bomb Iran. Podhoretz says heavy and immediate strikes against Iran are necessary to prevent that country from developing nuclear weapons. “None of the alternatives to military action—negotiations, sanctions, provoking an internal insurrection—can possibly work,” Podhoretz says. “They’re all ways of evading the terrible choice we have to make which is to either let them get the bomb or to bomb them.” Podhoretz says that such strikes would be effective: “People I’ve talked to have no doubt we could set [Iran’s nuclear program] five or 10 years. There are those who believe we can get the underground facilities as well with these highly sophisticated bunker-busting munitions.” (Podhoretz does not identify the people he has “talked to.”) “I would say it would take five minutes. You’d wake up one morning and the strikes would have been ordered and carried out during the night. All the president has to do is say go.” Giuliani has echoed Podhoretz’s belligerence towards Iran; last month, Giuliani told a London audience that Iran should be given “an absolute assurance that, if they get to the point that they are going to become a nuclear power, we will prevent them or we will set them back five or 10 years.” Podhoretz says he was pleasantly surprised to hear Giuliani make such assertions: “I was even surprised he went that far. I’m sure some of his political people were telling him to go slow…. I wouldn’t advise any candidate to come out and say we have to bomb—it’s not a prudent thing to say at this stage of the campaign.” Podhoretz has given President Bush much the same advice (see Spring 2007). 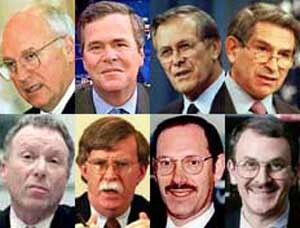 Giuliani's Stable of Neocons - Since July 2007, Giuliani has surrounded himself with a group of outspoken hardline and neoconservative foreign policy advisers (see Mid-July 2007). Perle is not a neoconservative. 'No Such Thing as a Neoconservative Foreign Policy' - Perle tells the gathering, hosted by National Interest: “There is no such thing as a neoconservative foreign policy. It is a left critique of what is believed by the commentator to be a right-wing policy.” Perle has shaped the nation’s foreign policy since 1974 (see August 15, 1974, Early 1976, 1976, and Early 1981). 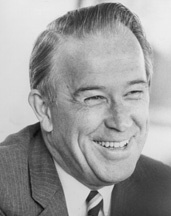 He was a key player in the Reagan administration’s early attempts to foment a nuclear standoff with the Soviet Union (see Early 1981 and After, 1981 and Beyond, September 1981 through November 1983, May 1982 and After, and October 11-12, 1986). Perle denies any real involvement with the 1996 “Clean Break” document, which Milbank notes “is widely seen as the cornerstone of neoconservative foreign policy” (see July 8, 1996 and March 2007). Perle explains: “My name was on it because I signed up for the study group. I didn’t approve it. I didn’t read it.” In reality, Perle wrote the bulk of the “Clean Break” report. Perle sidesteps questions about the letters he wrote (or helped write) to Presidents Clinton and Bush demanding the overthrow of Saddam Hussein (see January 26, 1998, February 19, 1998, and September 20, 2001), saying, “I don’t have the letters in front of me.” He denies having any influence on President Bush’s National Security Strategy, which, as Milbank notes, “enshrin[ed] the neoconservative themes of preemptive war and using American power to spread freedom” (see May 1, 2001), saying: “I don’t know whether President Bush ever read any of those statements [he wrote]. My guess is he didn’t.” Instead, as Perle tells the audience: “I see a number of people here who believe and have expressed themselves abundantly that there is a neoconservative foreign policy and it was the policy that dominated the Bush administration, and they ascribe to it responsibility for the deplorable state of the world. None of that is true, of course.” Bush’s foreign policy had “no philosophical underpinnings and certainly nothing like the demonic influence of neoconservatives that is alleged.” And Perle claims that no neoconservative ever insisted that the US military should be used to spread democratic values (see 1965, Early 1970s, Summer 1972 and After, August 15, 1974, 1976, November 1976, Late November, 1976, 1977-1981, 1981 and Beyond, 1984, Late March 1989 and After, 1991-1997, March 8, 1992, July 1992, Autumn 1992, July 8, 1996, Late Summer 1996, Late Summer 1996, 1997, November 12, 1997, January 26, 1998, February 19, 1998, May 29, 1998, July 1998, February 1999, 2000, September 2000, November 1, 2000, January 2001, January 22, 2001 and After, March 12, 2001, Shortly After September 11, 2001, September 20, 2001, September 20, 2001, September 20, 2001, September 24, 2001, September 25-26, 2001, October 29, 2001, October 29, 2001, November 14, 2001, November 20, 2001, November 29-30, 2001, December 7, 2001, February 2002, April 2002, April 23, 2002, August 6, 2002, September 4, 2002, November 2002-December 2002, November 12, 2002, February 2003, February 13, 2003, March 19, 2003, December 19, 2003, March 2007, September 24, 2007, and October 28, 2007), saying, “I can’t find a single example of a neoconservative supposed to have influence over the Bush administration arguing that we should impose democracy by force.” His strident calls for forcible regime change in Iran were not what they seemed, he says: “I’ve never advocated attacking Iran. Regime change does not imply military force, at least not when I use the term” (see July 8-10, 1996, Late Summer 1996, November 14, 2001, and January 24, 2004).